Home » Integrated Urban Development » Are you working on fringe? 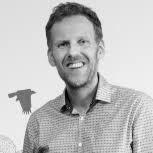 Maarten van Tuijl takes a look at the “sub>urban, re-inventing the fringe" network, across 9 cities, re-thinking city fringes over the past 2,5 years and working on the implementation of local action plans on pilot sites. So, he asks: what did we learn and what are our recommendations for working on the fringe? The fringe is the post war urban area in between the inner city and the suburbs. Besides being an unsustainable fragmented belt of often sub-optimal and mono-functional land usage cut by big infrastructure with pockets of social deprivation, the fringe also holds the promise of combining the best of both worlds. It has more amenities and is closer to the city centre than the low density suburbs, but also offers more space and green space than the city centre. To both face its challenges and to fulfil its promises, the renewal of the fringe demands a new approach to urban planning. Because most of the property in the fringe is privately owned and administrations have limited powers there, a new approach to urban renewal is needed. 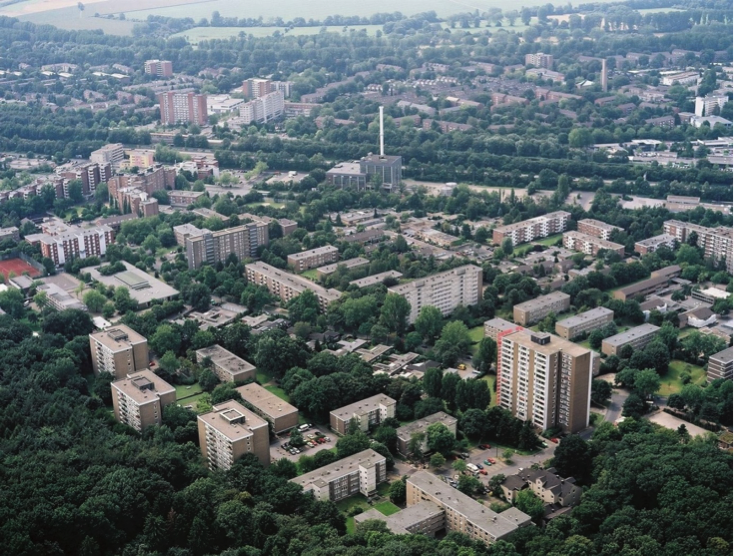 Located in the southern part of Düsseldorf’s fringe, Garath is a typical housing project district of the 1960s and ’70s. Garath faces specific challenges: the district is home to 18,730 inhabitants, of whom 11% are unemployed, a higher proportion compared to Düsseldorf as a whole. Rents are below the city average and the living space is often not adequate for today’s demands, which sometimes leads to a concentration of social problems. In addition, there are other urban deficits such as a patchy retail supply and a lack of attractive green and open spaces. - and an advisory board (members of local council, stakeholders). A special feature of the Garath 2.0 project is the comprehensive participation of citizens, with different formats integrated into each planning step. Managing the transformation is only possible if the inhabitants are involved and support the change. Therefore, the residents have been included in the planning process right from the start. The participation formats aim at gaining the active cooperation of different sections of the population and different age groups and to involve them in the planning phases. This intensive participation fosters the network of initiatives already there and supports a better exchange. Particularly noteworthy is Neighbourhood Branding, a project aimed at mapping a shared perception of the future of the neighbourhood. The residents specified what they saw as needs for action and development. To gain this information different kinds of participation tools were used: a kick-off meeting, a community festival, neighbourhood talks, interviews with the mayor, aldermen, administration and stakeholders, a branding session, workshops and a future conference. Children and young people were also invited and involved. Based on this input 50 measures have been planned in total. Some are already being put into action, while others are still being planned. Start with a careful analysis of what is already there. Know your fringe: the buildings and the people. What are the characteristics of the present fringe? How does it function at the moment? Who is living and working there? Who are the owners of the land and buildings? Who should be involved (participation)? What exactly should be done for whom? These are questions that all cities must reflect on when planning for the fringe. It is not only about analysis, it is about recognizing and reinforcing these qualities. Go from tabula rasa to tabula scripta. Because of Solin’s rapid growth, the public domain is fragmented and is generally underused. In the past few years, citizens have noticed this and expressed the need to reconnect with the waterfront. Large physical infrastructural barriers are not easily removed, however, especially not for a small municipality in Croatia. Building a large tunnel or reducing the number of lanes or the speed limit is not possible at this moment. Instead of being paralysed by these problems, Solin focused on making the mental barriers smaller. By making small, inexpensive and innovative interventions in the segregated urban space, the barriers themselves were put in the spotlight and treated as an opportunity. Solin has realized several specific projects aimed at creating new connections and uses. The first project is a pedestrian underpass beneath a street with heavy traffic, which children use daily on their way to and from school. To avoid the danger of making it an unattractive and dark space that ends up underused, the walls were painted with site-specific graffiti. The underpass area is larger than its primary function requires, making it more of a space and less of a passageway. There is even scope for small-scale sporting activities. Thus, the underpass has become a new public space and a new tourist attraction because the artists are internationally known. A second project concerns the refurbishment of the beach. This beach had been used for generations, but because of industrial expansion during the 20th century and regional infrastructural networks, it had become isolated and abandoned. The city decided to adopt a participatory approach to activate its underused areas, involving the local citizens in the design process. Together they have started with a clean-up of the beach and seabed. Currently, they are in the process of site-development and landscape works. Even with these small improvements, citizens have started to use the beach again, reclaiming the public space. For this site, nearby industrial companies and the County were persuaded to provide funding as a sponsorship of the public space. Many parts of the fringe have been neglected for too long. The buildings and public space in the fringe need to be upgraded. Increase the sustainability of existing buildings. Stimulate more sustainable, less car-based, mobility. Improve conditions for existing communities. Make better use of underused areas and buildings. Find new, interesting typologies for housing. Integrate social infrastructure, jobs and production. Turn this unloved outcast into a loved part of the city. Starting with mind-opening dialogues and an exploratory kick-off discussion, collective ambitions for the area were defined. The first idea of a multi-plot development was born. Each owner started looking beyond his/her own plot, enlarging the spatial opportunities. Another instrument was a safari tour of the site in the form of a guided walk with all the stakeholders. The brochure made for the walk showed the soil contamination and possible future development scenarios in one, five and twenty years’ time. On the one hand, this information made the owners aware that the current land use plan needed to be changed in order to realize the long-term plan. On the other hand, it became clear that soil decontamination was an issue for more than one owner. One of the owners demanded that the land use plan (RUP) be altered or he would withdraw from the co-creation project on this site. At this point, the role of the city evolved from facilitating to regulating, denying the owner’s demand in order to stress the importance of a joint plan and a common urban vision. 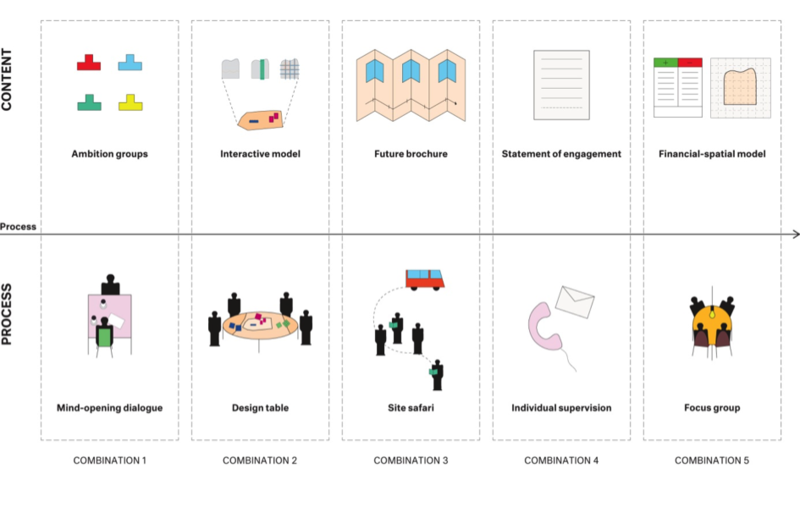 A second step was co-creating a design plan for the area and making it more visual by using an interactive scale model. This prompted one of the private partners to ask: “What is my financial gain?” In a classic process, providing the answer to that question would delay the entire process. In the Lageweg process, however, we started to work simultaneously on the financial aspect of the multi-plot development. Working on parallel tracks speeds up the process instead of blocking and delaying it. The financial question demonstrated the benefits of the collective process used in Lageweg. The Lageweg pilot project is a learning process, both for the city and for the owners concerned. The government has to assume the role of facilitator to get all stakeholders to support a co-creative vision and ensure that the owners make it happen. At the same time, it is necessary to guard the common interest. This balance is a continuous challenge. The fringe is the manifestation of individualism and consumerism. To have any impact here it is necessary to create incentives that make it appealing to go beyond individual interests. Link people and projects to one another. Deploy temporary use and place-making as tools to create stronger communities. Stimulate private owners to work together in their own interest. Make collective spaces more attractive. Encourage multifunctional use of spaces and interaction. The Viennese municipality boundaries are very tight around the historical city, leaving Vienna no choice but to work together with neighbouring communities to provide houses, amenities and jobs for its growing population. Vösendorf, a small neighbouring community of 7,000 habitants in the south-west, built large retail and shopping centres on the boundary with Vienna during the 1960s and ’80s, which proved to be very profitable but has put strain on its relationship with Vienna. Today, however, both municipalities need each other. A large part of the retail area in Vösendorf is decaying and in need of transformation while Vienna is actively looking for new neighbourhoods to absorb their growth in a connected and sustainable way. 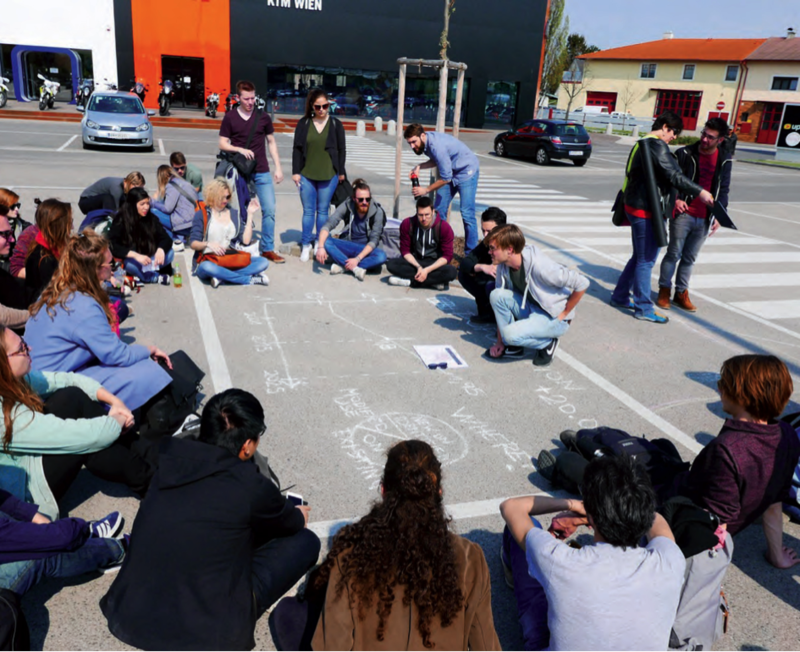 The two municipalities decided to work together in the URBACT network to imagine a future for a part of Vösendorf and Liesing, bordering the 23rd district of Vienna. According to Austrian constitutional law, the municipality – the lowest administrative entity – is responsible for land use planning. Each of the nine Austrian provinces has its own planning law, and the municipalities are obliged to apply it in their own spatial plans. Vienna is a province and a municipality at the same time. While our neighbouring municipality Vösendorf applies the Lower Austrian Planning law, Vienna uses its own. Thus, there is no formal authority that coordinates and regulates planning across provincial borders in a formally binding way. As there is not much likelihood of any change in the near future, Vienna is trying to work together in a more ‘informal’ way. The Stadt-Umland-Management acts as an intermediary to help us manage such processes. Generally, institutions act within their own competences and hierarchies. When elaborating the Integrated Action Plan, Vienna tried to overcome this hurdle and asked all relevant stakeholders to contribute to the discussion by thinking very freely about ideas for the cross-border project area. 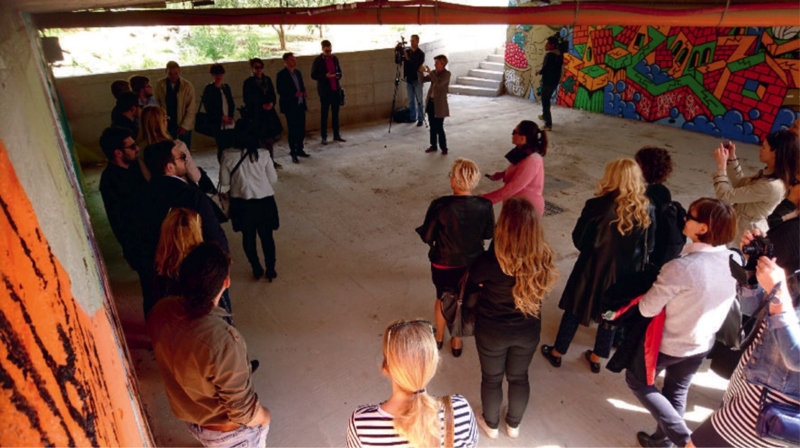 The stakeholders were invited to a series of workshops, walks and bilateral talks and followed the principle that any event should take place on the spot, for example in a local discotheque. The various participants drafted a vision, which led to four scenarios: the so-called Stories from the fringe. They act as the basis for implementation projects we want to initiate. The structure provided by the URBACT sub>urban network allowed us to establish a more sustainable working routine. At the beginning of the project, we reached a formal agreement between Lower Austria, Vösendorf and Vienna on personnel and financial contributions. We got to know our neighbours, their perception and visions. We contributed to a better climate of trustfully working together. The project acted as a broker for cross-administrative relationships. We reached the most relevant institutions and players on an administrative and political level, and some of the landowners. As one outcome of the Integrated Action Plan we are going to tackle five implementation projects. As a second step – in line with the topic of each project – we would like to involve the people who work or live in the respective area. We are starting to notice an increase in awareness. Cooperation between all administrative bodies in a metropolitan region seems to be essential for prosperity and a sound settlement development. Planning for the fringe can’t be done from a fixed and single perspective. Work on the level of the city´s urban strategy and test this strategy in one or more pilot projects at the same time. Complement concrete findings on the local level with the ambitions of the strategic plan, and vice versa. Integrate interaction and reflection on both levels. Today, the formerly booming industrial town Casoria, next to Naples, is in crisis. Several industries have relocated their factories, many shopping centres are struggling, and there are a lot of vacant office spaces while services have been cut back. In addition, the population is in decline, unemployment stands at 30%, and citizens are generally distrustful of public policies. The urban settlements were built in a dense and illogical way and there is a lack of public space. Too many challenges to tackle all at once, therefore Casoria has launched the step by step lab as its new urban plan, addressing short term, midterm and long term goals in an intelligent and interconnected way. The first Operational Program focuses on the abandoned, underutilized and degraded areas – the so-called ‘wastescapes’ – flanking the major infrastructures that cross the territory. The strategy uses wastescapes to push the urban transformation. In this case a large open park (forest, playground, additional facilities) – whose extension in 2025 will amount to a quarter of the entire municipal territory – will change the urban structure of Casoria, especially the perception of inhabitants and stakeholders. The current brown-grey settlement will be progressively converted into a living green city. Real and executed transformation projects are essential for the success of the planned activities. That is why the strategy starts with small-scale actions: temporary public uses of abandoned lands, massive planting of trees and hedges, and steady redesign of pedestrian, cycling and ecological paths. This first steps show direct results which builds the trust of citizens in the local government. At the same time it is a learning experience for the city offices, the politicians and the participating citizens. Gradually the step-by-step strategy moves forward to more complex transformations: the redevelopment of brownfields, the renewal of high-density urban areas and the restoration of historical settlements. As a first step Casoria has transformed and opened a formerly fenced off Military base as a public park in this dense city lacking public space. During its first URBACT local Group meeting the stakeholders present were asked why public space in the city was taking care of so badly. This has lead to awareness that each citizen has a responsibility towards the public space and its maintenance and eventually to citizens the co-management of the park. ). A wide participation process has been facilitated by a massive information campaign, conducted on social media. 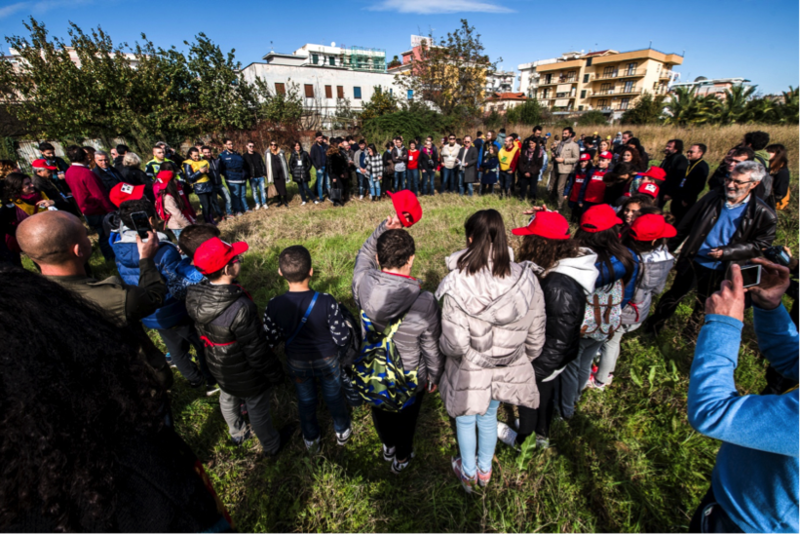 Thus, many citizens and local stakeholders are now involved in the co-creation and co-construction of the public Michelangelo Park (about 3.5 ha, the largest in Casoria). Work with a flexible plan and integrate learning moments. Work today on short, intermediate and long term plans. Plan for the fringe based on the full life cycle of an area. Work with the current context, learn from it and anticipate the new operational phase by organizing management. Each step can feed the learning process and can help the strategic plan grow to achieve a more sustainable and inclusive fringe.